A member of either the allosauridae or possibly chacarodontisauridae family, Acrocanthosaurus was originally classified in 1950 into the allosauridae, but was reclassified in 1956 to Megalosaurus by Alfred Romer, however many paleontologists took it to be a spinosaurid due to the small spines attached to its vertebrae. The thought that it was a spinosaurid was further held until the 1980s, when it was accepted as an allosaurid. The belief that it may be a chacarodontisaurid arose due to discoveries in the teeth & lower jaw that bear similarities to Giganotosaurus. Acrocanthosaurus is also lacking in eye crests, a main feature of many allosaurids. The debate over the purpose of Acrocanthosaurus' spines is divided into two main groups, one with two smaller subdivisions. 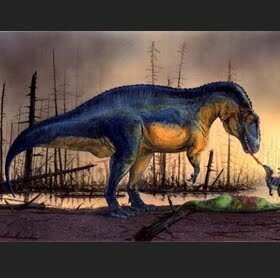 There are those who believe that Acrocanthosaurus' spines acted as a support for a sail & those who think they were support for muscles in the back that strengthened the dinosaur. Between the group who opt for the sail, one half think it was used as a temperature regulating device & the other half think it was used as a display & could be flushed with blood. If the purpose of the spines is support for a sail, then it may be a mixture of the two. It was most likely the apex predator of its area.